GTT has concluded a contract with the Norwegian shipyard VARD for the supply of the LNG tanks of the Icebreaker expedition ship, which will be operated by Ponant. This ship, the delivery of which is planned in 2021, will be the first electric hybrid cruise ice-breaker with LNG propulsion. Specially designed for the specificities of the LNG as a fuel, these tanks will be equipped with GTT's Mark III membrane technology, which is widely proven in the field of LNG transportation. GTT will conduct the construction of the tanks and will be in charge of selecting and coordinating its subcontractors, offering a turnkey solution to its partners VARD and Ponant. The Ponant Icebreaker is intended for polar expeditions of two weeks to one month. Thanks to its two tanks with a total capacity of 4500 m3, this ship will be capable of making its entire routes using LNG. This performance is made possible by the compactness of GTT's membrane containment system which optimises the payload in very restrained spaces, thereby increasing the autonomy of the ship. 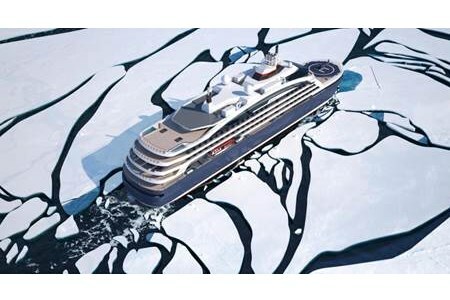 "The Ponant Icebreaker is a real world first. It is the first luxury ship with Ice Class PC2 certification ever designed, with electric hybrid engine and propelled by LNG, it is a pioneer in terms of sustainable cruising and environment protection", commented Jean Emmanuel Sauvée, CEO of Ponant. Philippe Berterottière, Chairman and CEO of GTT, declared: "This project sets an important milestone in the development of the LNG as a fuel. GTT is proud to bring its expertise to Ponant and VARD, two important players of the maritime world, for the supply of the tanks of this particularly innovative and environmentally friendly ship."